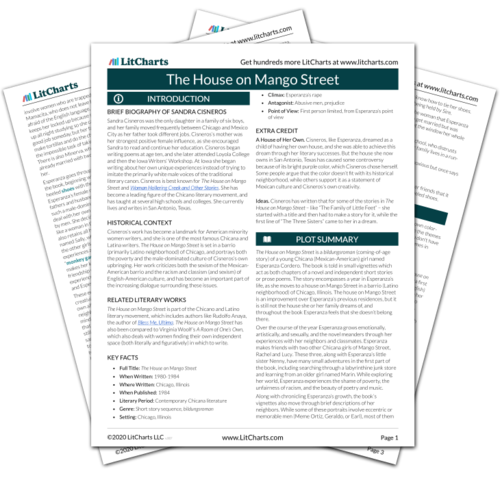 Instant downloads of all 942 LitChart PDFs (including The House on Mango Street). 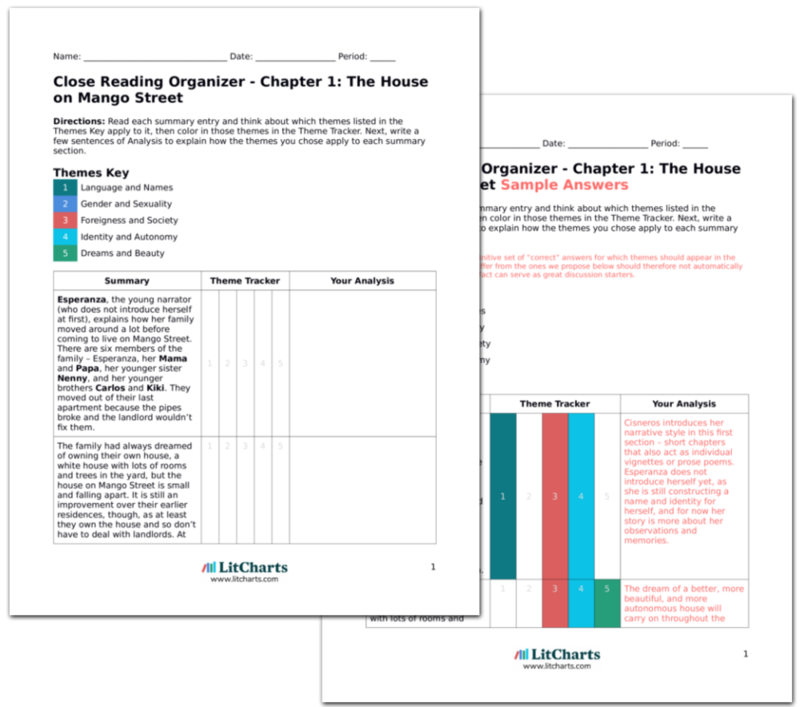 LitCharts assigns a color and icon to each theme in The House on Mango Street, which you can use to track the themes throughout the work. Esperanza describes the hair types of each member of her family. Her own hair is “lazy” and doesn’t act like she wants it to. Her mother’s hair is curly and beautiful, and it smells like warm bread. Esperanza likes to sleep near her mother and smell her hair. This shows how the chapters flow – they are short and only vaguely connected sometimes, as a young girl might associate things as her attention wanders. Esperanza’s mother appears as a comforting female presence here, but will not return for a while. This section also captures Esperanza’s discomfort with herself at this stage of her life through her dislike of and inability to tame her own hair. Cosby, Matt. "The House on Mango Street Chapter 2: Hairs." LitCharts. LitCharts LLC, 22 Jan 2014. Web. 18 Apr 2019. Cosby, Matt. "The House on Mango Street Chapter 2: Hairs." LitCharts LLC, January 22, 2014. Retrieved April 18, 2019. https://www.litcharts.com/lit/the-house-on-mango-street/chapter-2-hairs.